(Phys.org)—An international team of astronomers has discovered three new exoplanets using a Qatar-based planet-searching survey. The newly discovered gas giant exoworlds belong to the so-called "hot Jupiter" family of planets and were designated Qatar-3b, Qatar-4b and Qatar-5b. The findings were presented in a paper published June 23 on arXiv.org. The planets were identified by the Qatar Exoplanet Survey (QES), operated by the Qatar Environment and Energy Research Institute (QEERI), which is part of Hamad Bin Khalifa University (HBKU) in Doha, Qatar. The survey utilizes a robotic wide-field camera system located in New Mexico to search for gas giant planets that transit relatively bright host stars. The project proved its planet-searching capabilities in 2010 and 2011 when it detected the Qatar-1b and Qatar-2b exoplanets. Recently, an international group of astronomers, led by Khalid Al-Subai, QEERI's acting executive director, spotted three new planetary transits via QES. The scientists also conducted follow-up spectroscopic observations to determine the physical characteristics of the newly detected planets. For this purpose, they employed the Tillinghast Reflector Echelle Spectrograph (TRES) at the Fred L. Whipple Observatory on Mount Hopkins, Arizona and the 1.23m Zeiss Telescope at the Calar Alto Observatory in Spain. The three detected planets are typical "hot Jupiters"—gas giant planets similar in characteristics to the solar system's biggest planet. These have orbital periods of less than 10 days and high surface temperatures, as they orbit their parent stars very closely. In the case of the three new alien worlds discovered by QES, the equilibrium temperature ranges from 1,400 to 1,700 K.
"We report the discovery of Qatar-3b, Qatar-4b, and Qatar-5b, three new transiting planets identified by the Qatar Exoplanet Survey. The three planets belong to the hot Jupiter family," the scientists wrote in the paper. 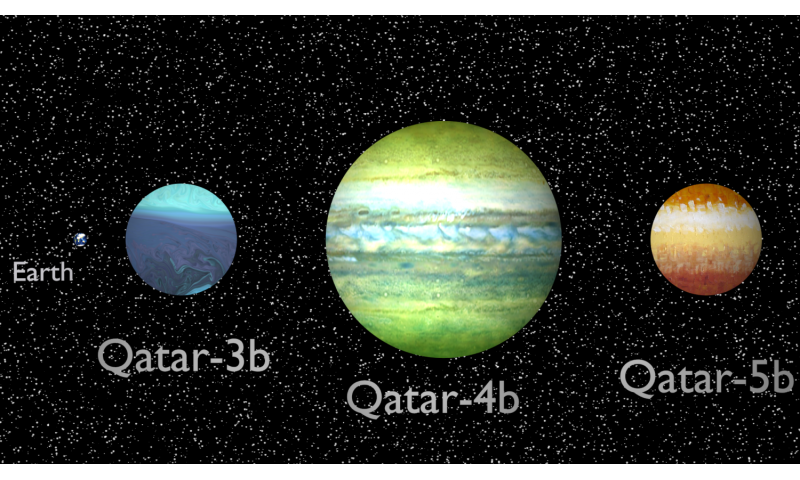 According to the research, Qatar-4b is the biggest and most massive of the newly found trio. With a radius of about 1.55 Jupiter radii, it is nearly six times more massive than our solar system's largest planet. It orbits its 13-billion-year-old sun-sized host star Qatar-4, every 1.8 days. Qatar-3b and Qatar-5b are of similar size and mass. They both are about slightly larger than Jupiter (1.1 Jupiter radii) and have approximately 4.3 Jupiter masses. Their orbital periods are also comparable as Qatar-3b orbits its parent star every two and a half days, while it takes Qatar-5b nearly three days to fully circle its stellar companion. "All three are short-period planets with masses and radii in the expected regime for hot Jupiters," the paper reads. The stars, orbited by the newly discovered planets, are only a bit larger than the sun and have a mass ranging from 0.95 to 1.15 solar masses. The research also reveals that Qatar-5 is one of the most metal-rich host stars known to date. The discovery proves that ground-based surveys like QES could be quite productive when it comes to exoplanet searching. The findings presented in the study could contribute to a more complete census of "hot Jupiters" and other close orbiting large exoplanets. The authors of the paper believe that future observations of this class of celestial bodies may provide a key to understanding their origin and planetary system architecture more generally . We report the discovery of Qatar-3b, Qatar-4b, and Qatar-5b, three new transiting planets identified by the Qatar Exoplanet Survey (QES). The three planets belong to the hot Jupiter family, with orbital periods of PQ3b=2.5079204 days, PQ4b=1.8053949 days, and PQ5b=2.8792319 days. Follow-up spectroscopic observations reveal the masses of the planets to be MQ3b=4.31MJ, MQ4b=5.85MJ, and MQ5b=4.32MJ, while model fits to the transit light curves yield radii of RQ3b=1.096RJ, RQ4b=1.552RJ, and RQ5b=1.107RJ. No evidence of eccentric orbit is seen in the radial velocity curve of any of the planets. The host stars are typical main sequence stars with masses and radii MQ3=1.145M⊙, MQ4=0.954M⊙, MQ5=1.128M⊙ and RQ3=1.272R⊙, RQ4=1.115R⊙ and RQ5=1.076R⊙ for the Qatar-3, 4 and 5 respectively. All three new planets can be classified as heavy hot Jupiters (M > 4 MJ), while Qatar-5 is among the most metal-rich stars known to host a planet.